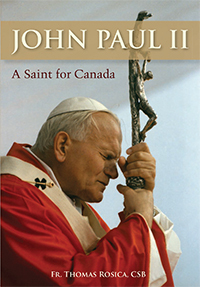 In honour of tonight’s celebration of our recently published book John Paul II: A Saint for Canada, we share with you a brief excerpt from the introduction of the book. If you’re in the Toronto area this evening, join us at St. Michael’s College and the Pontifical Institute for Mediaeval Studies for a wonderful evening with author Fr. Thomas Rosica, C.S.B.. When the throngs of people began chanting “Santo subito!” at the end of Pope John Paul II’s funeral Mass on April 8, 2005, what were they really saying? They were cry- ing out that in Karol Wojtyla, they saw someone who lived with God and lived with us. He was a sinner who experienced God’s mercy and forgiveness. He was the prophetic teacher who preached the Word in season and out of season. He looked at us, loved us, touched us, healed us and gave us hope. He taught us not to be afraid. He showed us how to live, how to love, how to forgive and how to die. He taught us how to embrace the cross in the most excruciating moments of life, knowing that the cross was not God’s final answer. He belonged to the entire world, but in a special way, he belonged to Canadians. More than any other pope in history, John Paul II had made his mark in this country, blessing and speaking to people from coast to coast. He even made a special trip back to a distant Aboriginal community in the far north just to keep a promise. He brought the papacy home to us, shared his concerns – and listened to ours – and made us believe he had seen into our souls. This book is about that special relationship. –John Paul II: A Saint for Canada by Fr. Thomas Rosica, C.S.B. I am looking forward to hearing Father Thomas when he comes to Niagara Catholic next week! Can I order a copy of the book to have him sign for me at that time?